In a medium saucepan over medium heat, bring 1 1/4 cups of the milk, sugar, gelatin and salt to a simmer. Whisk to completely dissolve the sugar and gelatin. In a medium bowl, whisk together the yolks, cornstarch and remaining 1/4 cup of milk. Pour 1 cup of the milk mixture into the egg mixture. Whisk to combine, then strain this mixture back into the remaining hot milk. Whisk the egg-milk mixture over medium heat until thickened, about 5 minutes. Remove the mixture from heat, and strain into a medium bowl. Add the butter and vanilla extract. Whisk the cream until smooth. Cover with plastic wrap, pressing the wrap directly onto the surface of the cream. Chill the cream thoroughly, up to overnight. Preheat the oven with a rack in the middle position to 350 degrees F.
Add the eggs to the butter-sugar mixture one at a time. Using a flexible rubber spatula, scrape the bowl between each egg addition. Add 1/3 of the dry ingredients to the butter-egg mixture, and stir until moistened before adding 1/4 cup of the milk. Repeat until all ingredients are combined, then stir in the vanilla extract. Butter and flour two 9-inch cake pans. Bake until the tops are lightly golden and a cake tester comes inserted into the center comes out clean, about 25 to 30 minutes. Rotate the cakes halfway through baking. Allow the cakes to cool in their pans for 10 minutes. Remove them from their pans and carefully transfer them to wire racks to cool completely. In a medium saucepan over medium heat, combine the chocolate chips, 3 tablespoons of cream and corn syrup. Stir occasionally until the mixture is completely combined. Remove the pan from heat, and stir in the vanilla. Place one cake layer top side down onto a large serving plate. Spoon the chilled pastry cream onto the center of the cake. Using an offset spatula, gently spread the pastry cream evenly across the top of the cake just up to the edges of the cake. Carefully place the second cake on top of the pastry cream. 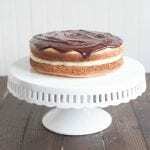 Store the assembled cake in the refrigerator while making the chocolate glaze. Pour the warm chocolate glaze over the top of the chilled cake. Allow the glaze to drizzle down the sides. Let the glaze firm up, then serve.